Lelystad Airport (EHLE) in The Netherlands. The Swedish Airforce has donated some of their old SAAB Viggen to aircraft museums around Europe. 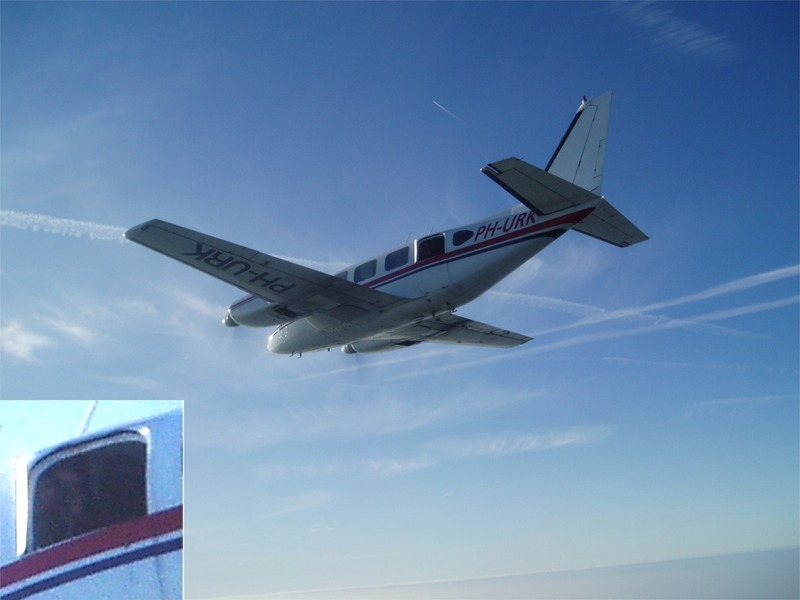 Captain Niklas Sandström flew on January 13, 2006, from F21 AFB in Luleå in the northernmost part of Sweden, with a fuel stop and final check at F17 AFB in Ronneby in Blekinge, the southeasternmost part of Sweden, before heading to Lelystad Airport in The Netherlands, delivering the aircraft. It will now be placed on permanent display at Aviodrome. 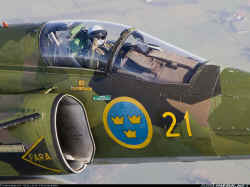 As Niklas expressed after this bittersweet last flight, and very last landing for Viggen, "This is a sad story, but, to place the fighters at different museums around Europe, is much better than making beer cans out of them!". The arrival of the Viggen in Dutch airspace heading for the Dutch Aviation Theme Park Aviodrome. An awesome sight for us but one with mixed emotions for pilot Niklas as this was his very last Viggen flight. Niklas moves on to the Gripen like we will move on to the next project, that's life I guess. Many thanks to all people involved especially the Swedish Air Force and Mark for making his last Aviodrome project an unforgettable experience. Willem Honders. Some pilots seem to have trouble understanding their assignment. Niklas, You are pilot flying the Viggen and while doing so, me photographer, photographs you. It can't be that hard. ;-) Willem. Yes, it say's "Final check at Blekinge Wing" in the air intake. This is the picture Niklas took in the previous close-up. A beautiful view, of the Piper PA-31 that met up at the border, and a beautiful January sky, with a calm Ijselmeer in the background. It's Willem in full action in the doorway! dappa.nl after visit to F21. 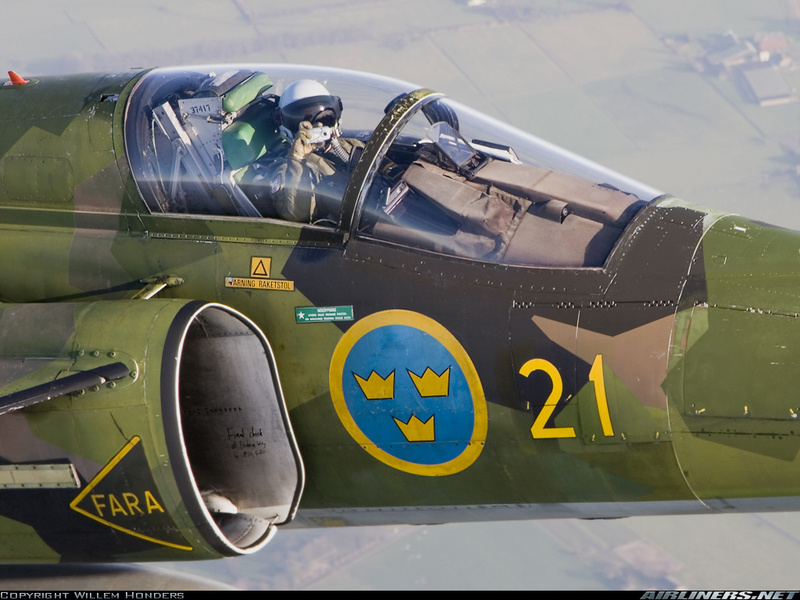 A clarification of the name "Viggen" "The Vigg". 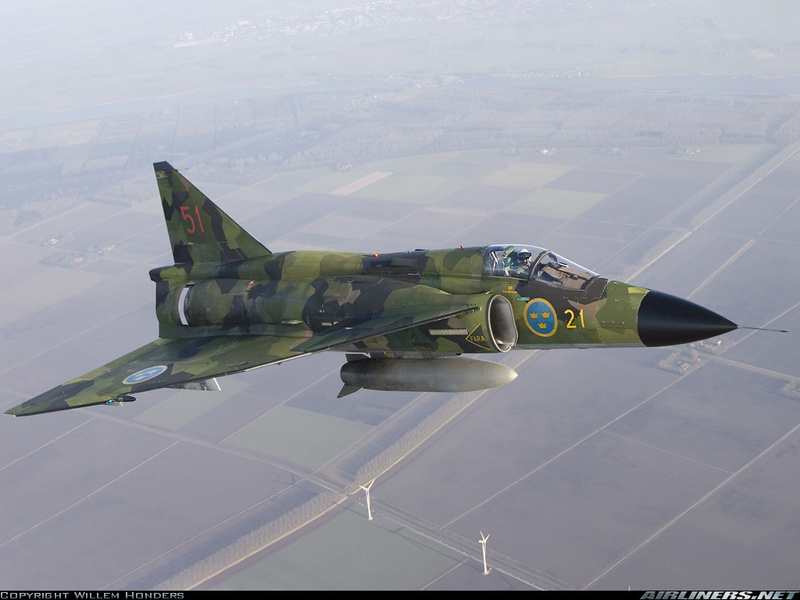 Some people wants to refer the name Viggen to "Lightning" or "Thunder Bolt", or something that strikes very hard. However, the two resembling words, with this meaning is "Åskvigg" and "Torsvigg", from the Nordic Mythology. The magical tools of the god "Tor", with both destructive and healing qualities. The stand alone word vigg can also be translated to the English word wedge. Perhaps not a striking name, but a good description of both shape and effect of the aircraft. The "canards" (the French word for ducks) that were introduced in this aircraft cannot be ignored. The name "Viggen" is also synonymous to a specific duck, in Swedish called Vigg, in English Tufted Duck (Aythya fuligula), here a closer look at Wikipedia. Though, Any connections to "Sitting Duck" is not relevant in this case! or at this placemark for Google Earth users! View the movie, from the occation at Aviodrome. Viggen has been donated to museums in Austria, The Czech Republic, Germany, France (2), The Netherlands, Poland, Slovenia, Spain, The United Kingdom, and in at least one of the Baltic countries. The pictures shown are published with permission from their respective copyright owners.